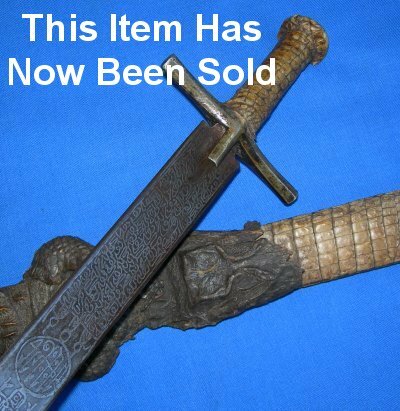 An exceptionally rare full crocodile skin Sudanese kaskara sword, in overall very good condition. Wow or Ugh! One of if not the most eye opening swords we have ever come across. A fully baby crocodile skinned kaskara, 19th / 20th Century, the blade almost fully covered with script. The crocodile complete except for losses to its upper jaw. The mighty 34 1/2 inch blade is in very good condition, engraved for nearly the full length each side. 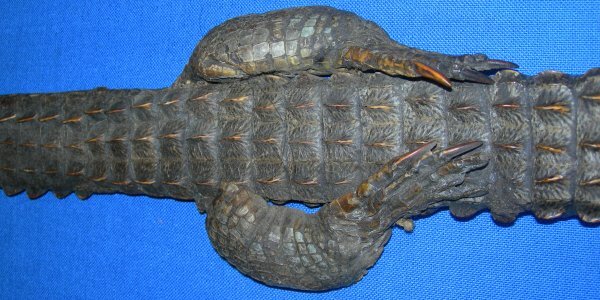 Firm in the crocodile skin grip, the cross hilt with a little movement. The scabbard made from a baby crocodile and some other crocodile skin. The crocodile actually in very good order for its age. The sword sheathes and draws very well.